Winter. Birds. Socks. Afternoon Delight. Another Saturday and another long run under the belt. Some of us like long runs more than others, but no matter how much we may or may not like spending a few hours on the road it is what makes a distance runner…well, a distance runner. Unfortunately, there is no miracle pill by which we will have the stamina, determination, or strength to make it to the finish line if we aren’t willing to put in the time on the road to help get us there. It’s more than one good long run too ~ it’s a whole series of them that we challenge ourselves with week after week. There are a lot of runners hitting the roads today. I’ve seen quite a few posts from friends and family about races they’re participating in or runs that they’re doing to start off their weekend too. Nothing like a little camaraderie to feel like you’ve got a force of running pals to help you get through the miles, and thank goodness for those random thoughts that sometimes pull us out of a momentary loss of consciousness. 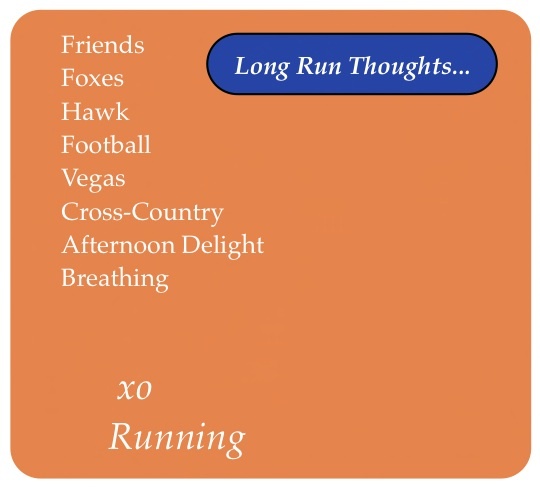 I asked my husband what he thought about today on his long run and was given a little glimpse into what was on his mind. His thoughts were different than mine, mostly. But in a unique way there were a few things where even though the miles separated us our thoughts intersected and we traveled on mutual ground if only for a short while. Running really does bring people together.